No Tears, No Sting, No Irritation. 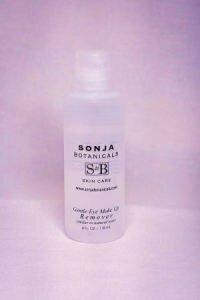 This clear liquid with no fragrance, quickly dissolves eye makeup without stress or pulling on your eyes. A must for sensitive eyes – no fragrance – no irritation! Prevents drying to delicate tissue around eyes and is oil and sulfate free. Benzalkonium Chloride is added to formula which acts as a gentle anti-bacterial property. AND you can use it to remove dark lipstick without drying your lips!